animals large and small roam un-fenced lands, living as they have for ages. Solitude, tranquility, and wilderness await." 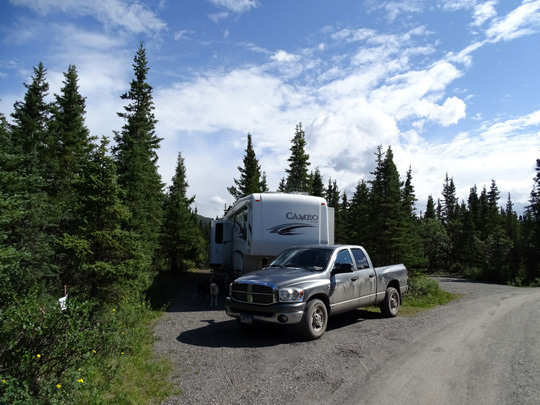 We're no experts on either RVing or Denali National Park but after three extended visits here in a moderately large (36-foot) 5th-wheel coach in 2012 and 2015 we've learned a thing or two that might be helpful to other park visitors. I might add an addendum after our next visit to the park late in August . . . 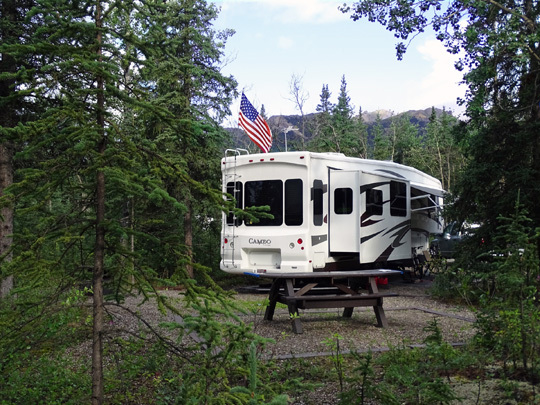 Some tips are specific to camping in the park but others should be useful to anyone who visits the park so keep reading even if you don't intend to drive your own or a rental RV to Denali. 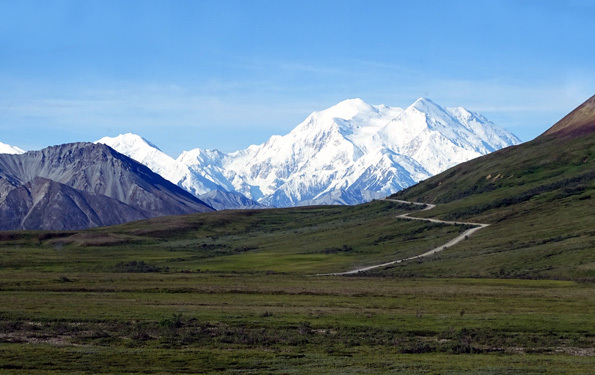 Because Denali's peak season is so short -- basically June, July, and August -- the recent annual visitation rate of "only" 400,000 people is concentrated mostly into three months. That means more competition for lodging in and out of the park, shuttle buses that are more crowded, more people on the popular hiking trails near the park entrance, and other potential inconveniences for guests. To see anything between miles 15 and 92 in the park, you'll need to take a shuttle bus. and get out to trailheads early in the morning when fewer people are on the trails. Camping and RVing have become increasingly popular as the economy has improved in recent years. 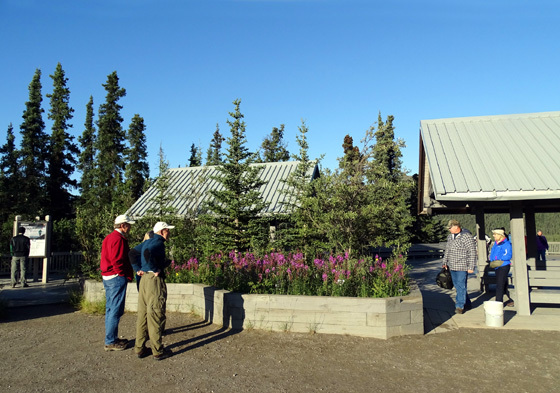 More and more people are vying for the same limited campsites, not just at Denali but at every popular vacation destination, public or private. National parks are especially popular, in part because the National Park Service has been heavily promoting itself and its centennial celebration in 2016. 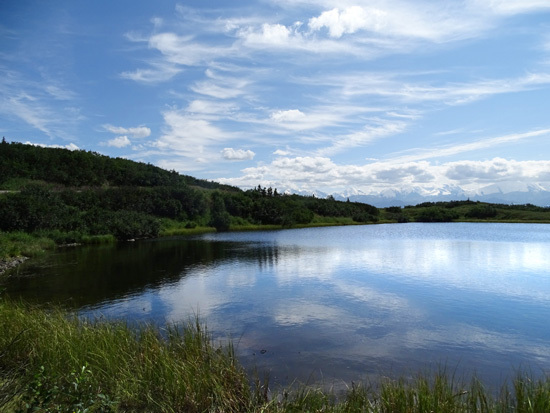 Each time we've camped in Denali most or all of the campsites at Riley Creek and Teklanika River have been occupied. You can't just show up during peak months and expect to get a site. The good news is that you can make campground reservations in the park online or by phone as early as December 1 of the previous year. That's what we did both in 2012 and this time. Yes, that's early and your plans may change. But that is today's reality. If you need to cancel, the fee is nominal. If you need to change the dates, do so as soon as possible. Please be considerate of other RVers and reserve the size of site that is appropriate for your rig. If you have a 25-foot Class C motorhome you can easily fit into any of the "B" sites for rigs under 30 feet. Don't book an "A" site and cheat someone with a 40-foot 5th-wheel out of a site. Nothing drives us crazier in a campground -- anywhere -- than someone in a little bitty rig parked in a big ole site when they had other more appropriate choices. RVs are getting bigger and bigger nowadays. Out 36-footer is six feet shorter than some new travel trailers and 5th-wheels but we still sometimes have problems finding sites large enough because folks with small RVs are occupying them. Just sayin'. 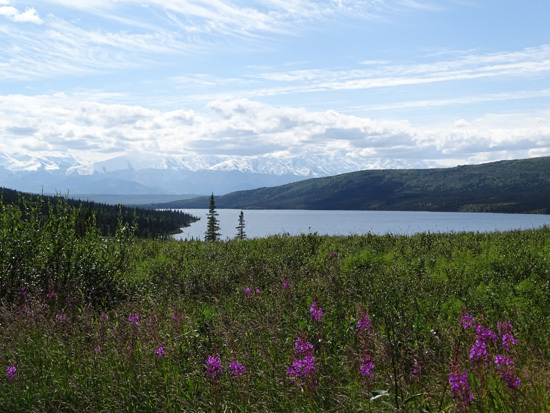 Both summers we pretty much planned the rest of our Alaska trips around the times we chose for Denali because this park was our Number One priority. 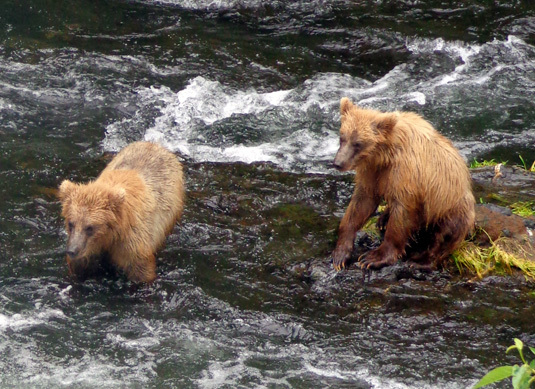 Note that there are no salmon in the streams in Denali but there are plenty of grizzly bears. In 2012 we were able to add a few days at Riley Creek to our early August trip to the park but I doubt we could have pulled that off this year. After our good experience in Denali three years ago we knew what we wanted to do this time. We also knew it'd be harder to add on days this year because more people were heading to Alaska (low fuel prices + more people RVing) so we were on the phone to make reservations on December 1. We chose dates to be at Riley Creek and Teklanika in the same order and for the same number of days that worked three years ago. We came earlier on this visit, however, so we could see what the park looked like earlier in the summer (e.g., different wildflowers in bloom). I also ordered my Tek Pass at the same time, although that wasn't as critical as the campground reservations. 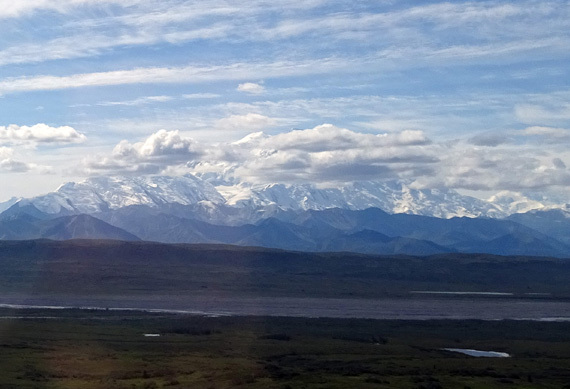 We've been lucky, I guess, to be able to spend up to two weeks at Denali at a time. Some people are here for only a day -- or less! I feel sorry for them. 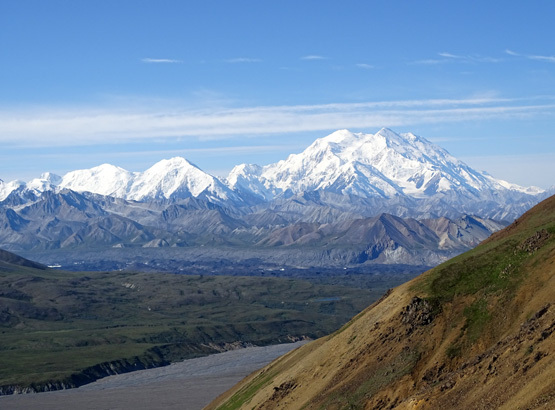 Denali is a humongous park -- six million acres -- with a lot of things to see and do. You can't do it justice in a short period of time. The very best advice we can give potential visitors is to allow as many days as possible to experience this spectacular park, even if you have to give up something else on your trip. One of the most important lessons we've learned in all our years of traveling is that the longer we stay somewhere we like, with sights and activities we really enjoy, the better experience we have. We're less frenzied, more relaxed, and can get a better feel for the area. 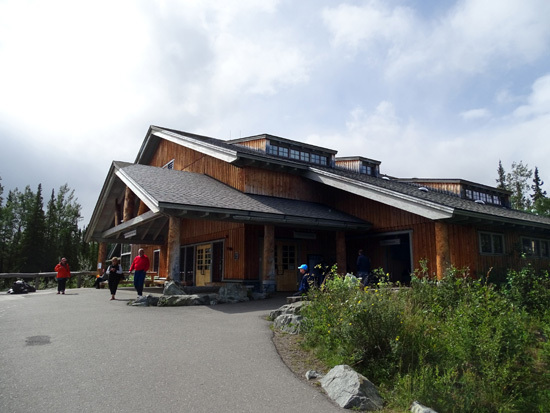 The two most important things at Denali for most visitors, domestic or foreign (note -- there are more foreign visitors here than U.S. citizens), is to see the mountain clearly and to see some grizzly bears up close. 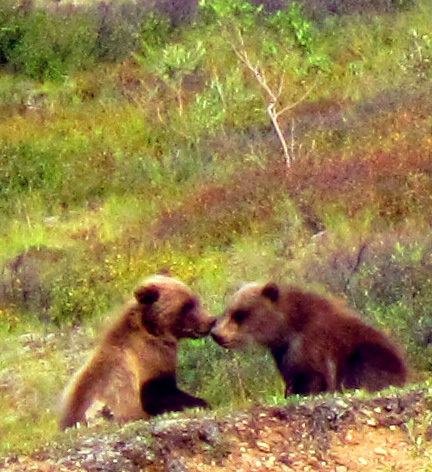 If you're in the park only a day or two, you're much more likely to see a grizzly bear on a shuttle bus ride into the backcountry than you are to see Denali "out." The namesake mountain is partially or totally hidden under clouds about 70% of the time. What a disappointment it must be for someone who's traveled thousands of miles to the park to be there only on a day when Denali is not visible! 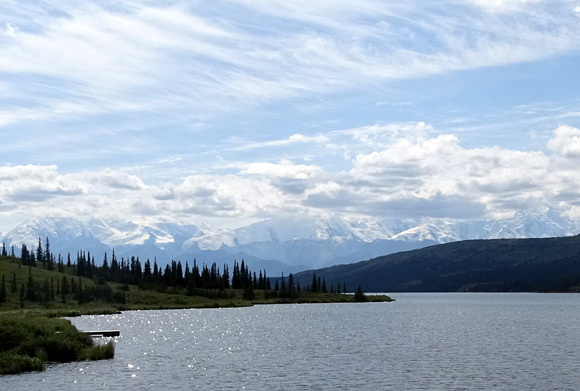 For your own sanity, try to pare your list of Must Do's on your first trip to Alaska to the bare minimum so you can truly enjoy the experience. In 2012 I wrote about one couple's tour company itinerary that had them frazzled by the second day. I wondered if they went home with any really good memories of that trip, or if they were just relieved to go back to work! 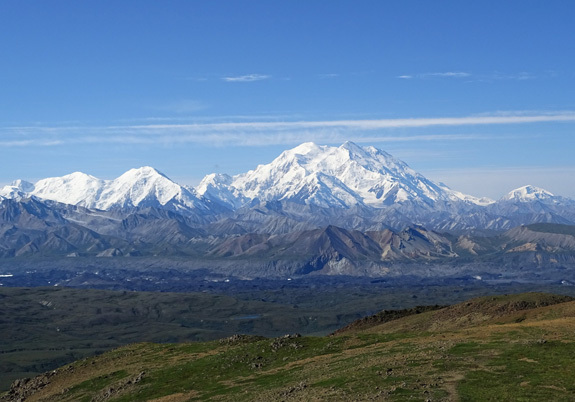 When Denali, North America's highest peak, is mostly or completely visible, it is said to be "out." 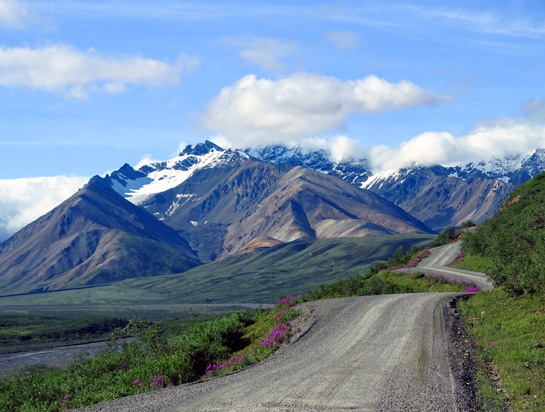 Historically, this happens only about 30% of the time during daylight hours when visitors are most likely to be out on the park road at various places where the mountain isn't hidden by other peaks in the Alaska Range. Like many mountain ranges, these high peaks are cloud magnets. 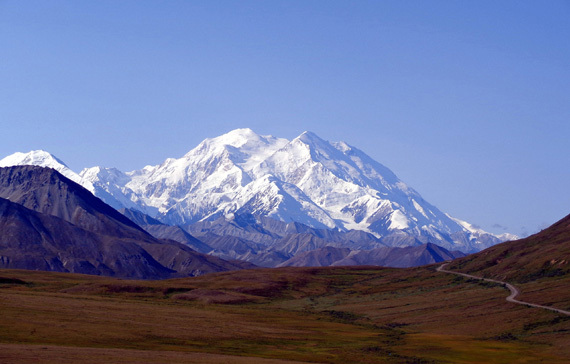 Denali towers above its base a whopping three-and-a-half vertical miles (2,000 to 20,320 feet), even more than Mt. Everest (14,000 to 29,028 feet). 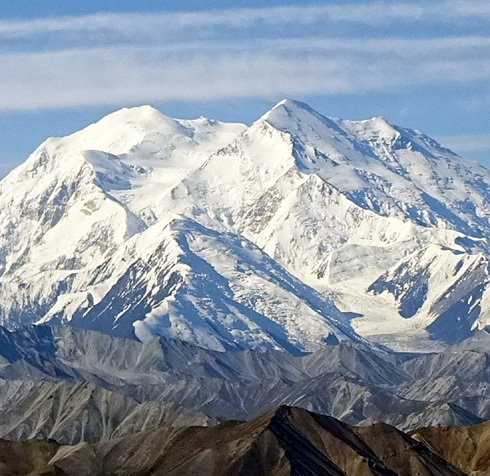 Like Everest, Denali is so massive it generates its own weather systems. 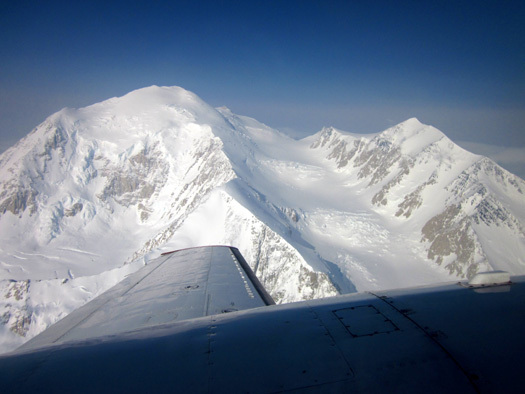 We found a third, less conventional and definitely more expensive, way to see Denali in all of its glory in 2012 -- by taking a flight-seeing trip over the mountain! 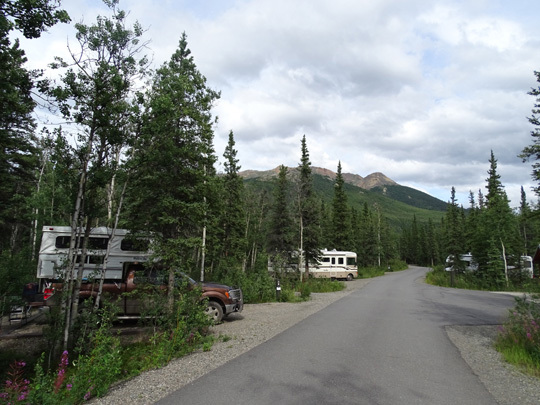 The day of our reservation was overcast down in the campground, in nearby Nenana Canyon, and at the airport near Healy. We wondered if we'd wasted a bunch of money on our tickets. However, we flew through and above the clouds at about 5,000 feet and it was gloriously clear and sunny for the upper 15,300 feet of the mountain. What a thrill to see it so close! We lucked out that day. 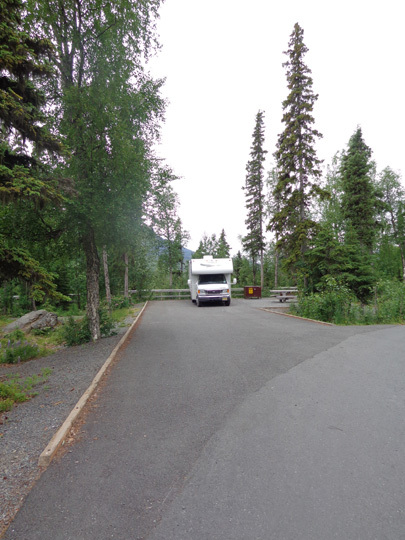 It was another lesson in mountain weather and also applies to bus trips back to Eielson and beyond -- even if the weather is overcast or rainy near the park entrance, just a few miles out the park road it could be clear and sunny. 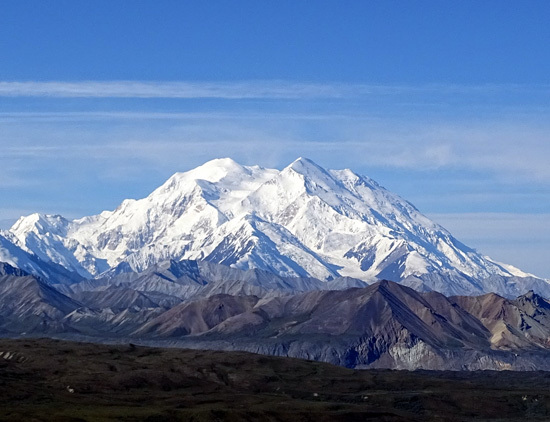 We've experienced that phenomenon several times at Denali and other mountainous locations. 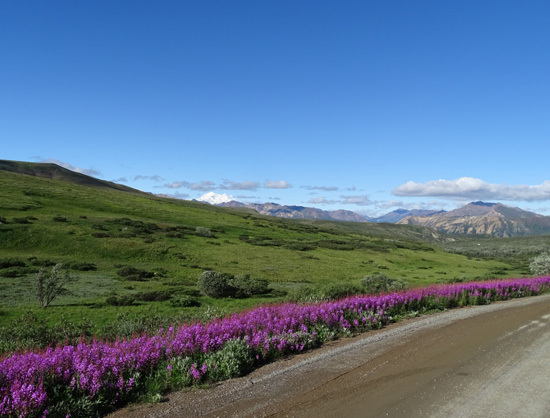 There are several places along the park road where you can see Denali from the road. 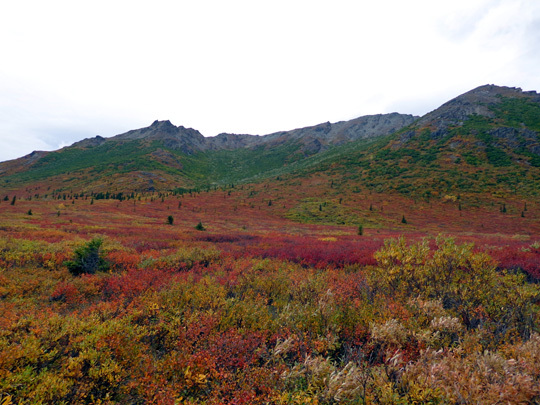 I think the best views are from Stony Hill at about 63 miles (the location where I got the photo that heads each page of this year's journal) and the Eielson Visitor Center area, including Thorofare Ridge. The road is a little closer to the mountain a few miles past Eielson but by the time the shuttle buses get out there, clouds have often limited the view of the The High One. From what I've learned from the shuttle bus drivers who have been going out to Wonder Lake and Kantishna for many years, you aren't very likely to ever get an iconic photo of Denali reflected in any of the lakes if you take a bus ride from the entrance or Tek. Conditions have to be perfect to get the perfect shot. Mother Nature and Father Time don't usually cooperate with that plan. The buses simply get out that far (86-88 miles to Reflection Lake or the far end of Wonder Lake) too late in the day when the clouds have already come in, or there is enough of a breeze that the water isn't smooth as glass. 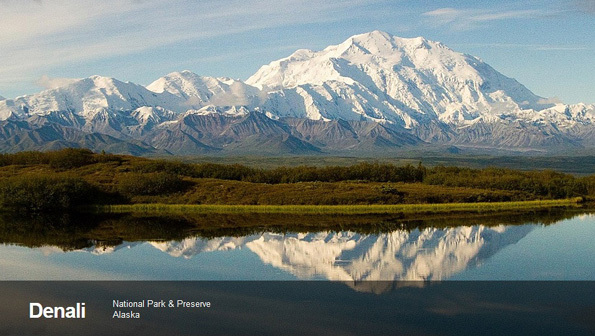 This photo is from the official Denali National Park website. The drivers say the only way to get the perfect reflection shots is to camp at Wonder Lake or stay at one of the private accommodations out near Kantishna, then get up very early in the morning on a clear, windless day and walk or ride to one of the locations where the mountain is visible to the south or east across the lakes. 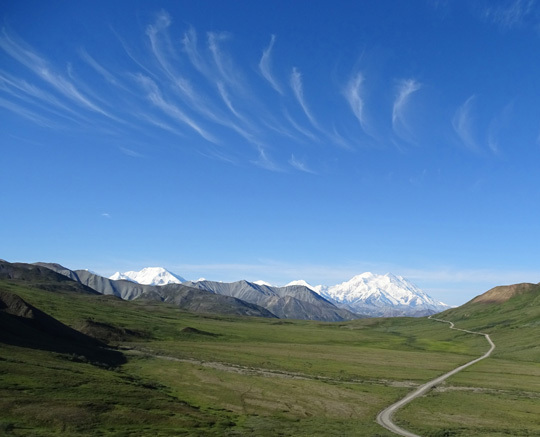 In 2012 I never went quite far enough out the park road to have a chance to observe Denali's reflection. Last week I was out far enough twice but too late in the day. Even though I saw Denali clearly in the morning both days, it was mostly under clouds by the time I got to Reflection Lake or the far end of Wonder Lake at 1 or 2 PM. although other photos in this entry show it clearly visible in the morning. If you're very, very lucky you might be on a Wonder Lake or Kantishna bus that gets out there before the clouds come in. If this happens and you're on one of the Kantishna buses, ask the driver to get off when it reaches Reflection Pond at about Mile 86 or the far end of Wonder Lake at about Mile 88 and catch the bus when it comes back. 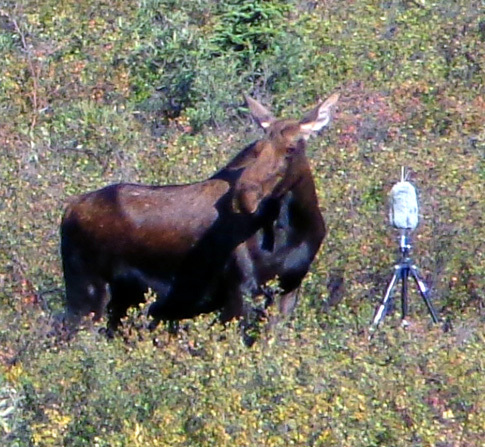 This is the second most important thing to the majority of visitors to Denali National Park -- seeing as many of the Big Five critters as possible. 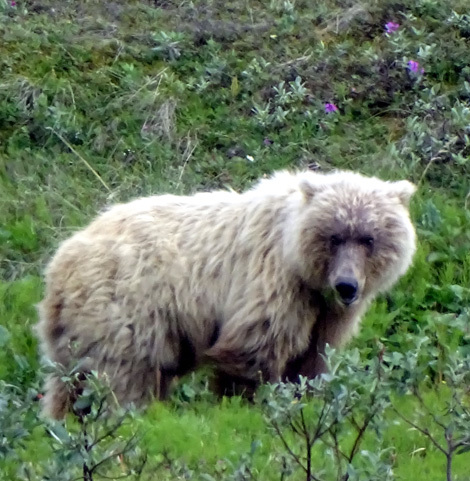 Although grizzly bears are probably the Number One animal on that list, people also love to see moose, caribou, wolves, and Dall sheep. Jim and I have been fortunate to see all of these animals in our three visits to the park, although we haven't seen as many this year as in 2012. Of course, there are many other interesting birds and animals in the park, including reclusive ones like wolverines and lynx that are less likely to be seen. However, Jim did see a wolverine in the Savage riverbed in 2012 on one of his bike trips. 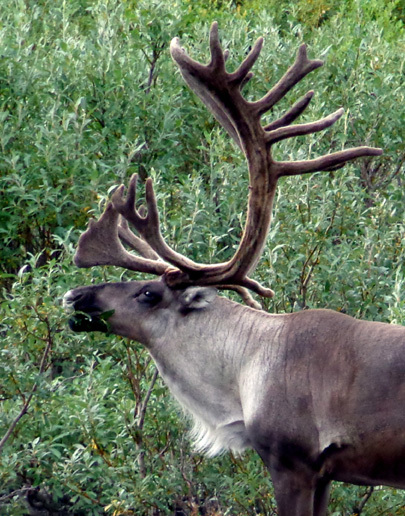 The good news is, you're as likely to see wildlife at Denali on a rainy day as on a sunny day. Their bellies need food regardless of the weather! There is no one "right" way to see wildlife. 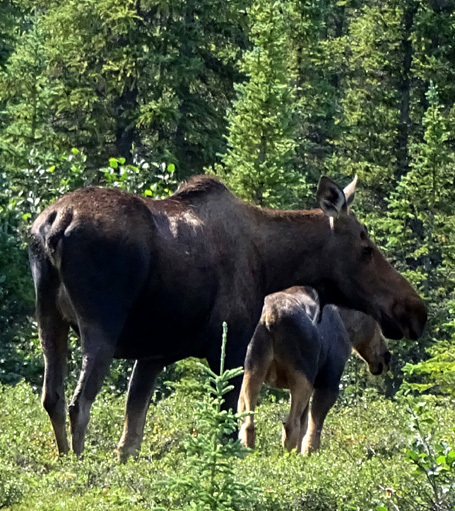 Moose and other critters can be seen from your own vehicle or a bus in the first 15 miles to Savage River and almost always on a bus on the rest of the 92-mile park road. Most of the bus drivers have driven the road four or five days a week for at least several summers and know the best places to spot certain kinds of animals. 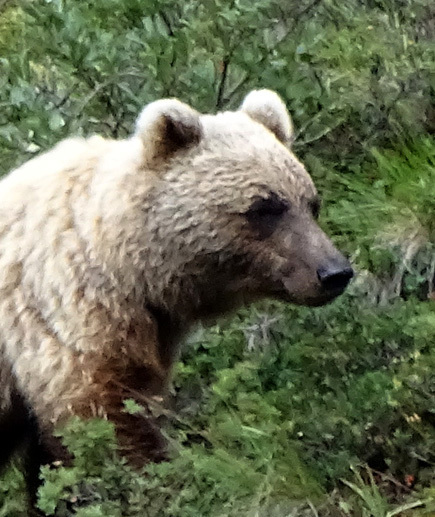 For example, grizzly bears are often seen near Sable Pass, and caribou near Stony Creek. 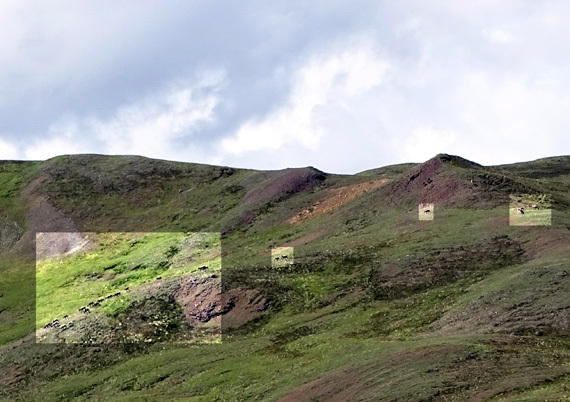 Passengers provide up to 50 more pairs of eyes so if you're the first to spot an animal, let everyone know what it is and where ("sheep at 1 o'clock," e.g., lets people know the approximate location). 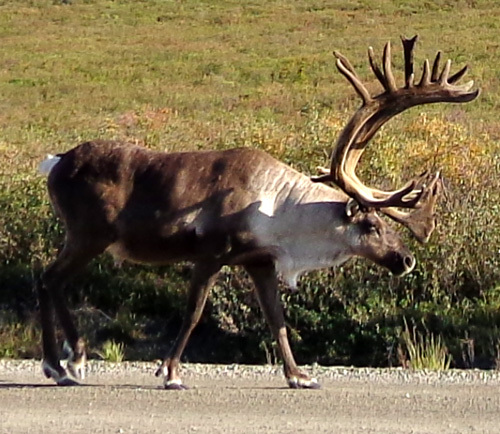 Unless the passengers have already seen a hundred of this animal already that day, the driver will gladly stop for a few minutes for folks to observe the critter and take pictures. 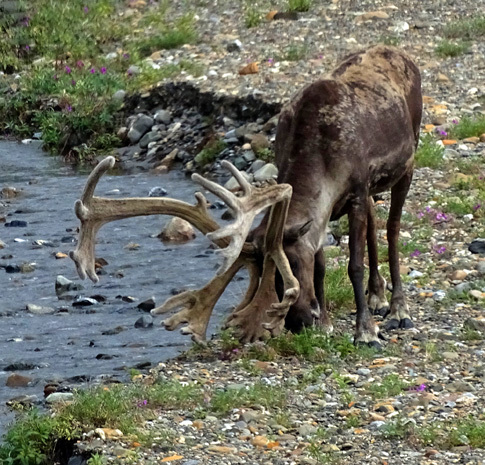 You may also see the Big Five on bike rides on the park road and hikes along the road, on established trails, or going cross-country through riverbeds, meadows, or the tundra. 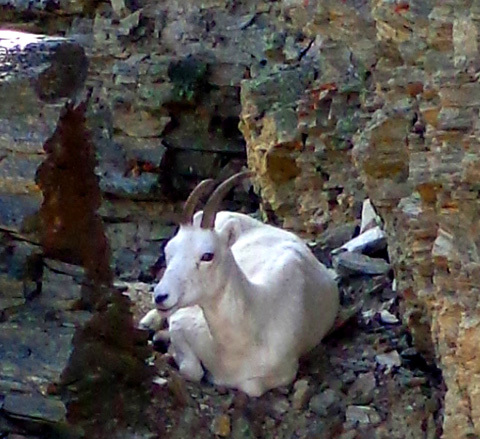 That's when Jim and I have gotten closest to these beautiful animals (most were three yeas ago). 5. Jim and I also saw a mama wolf playing with at least one cub on a bus ride three years ago but we didn't get any pictures of them. These and other animals often use the road, trails, and riverbeds as travel corridors so pay special attention to these areas. 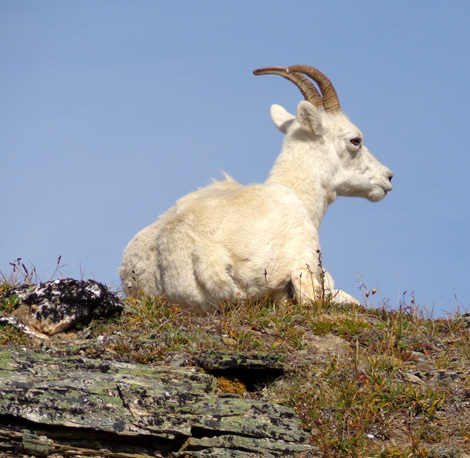 Binoculars and/or strong zoom lenses are also helpful for spotting wildlife. Shuttle bus rides up to 92 miles back the park road. There are also various types of narrated tours on buses. Nature photography; this park is a photographer's dream. Hiking: There are lots of hiking trails near the park entrance and a few farther out the park road. 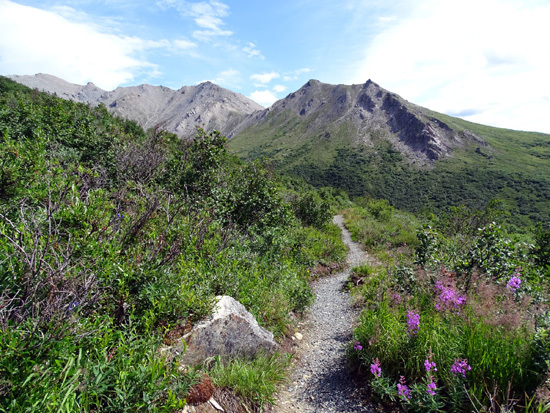 Denali park officials encourage visitors to hike off-trail, too, in riverbeds, meadows, and the tundra. How many other national parks allow, let alone encourage, that?? Cycling: Bikes and dogs aren't allowed on or off trails in the park but they are permitted on the bike path and park road. Jim has covered a lot of miles of the park road on his bike and thoroughly enjoyed each ride. Sled dog demo: Popular, free attraction in the park given twice a day. See park website for details. Discovery hikes off-trail at various points along the park road. Two daily hikes of moderate and strenuous intensity are limited to 11 hikers each. Sign up at the main visitor center and pay at WAC. If you want to see anything in the park beyond 15 miles -- that's as far as you can usually drive your own vehicle -- you must take a shuttle or tour bus. I wrote some tips about using the park bus system back in 2012 so I won't go into any details here. I re-read that entry and I think all the information is still valid. Check the park website for current bus information and schedules or, when you're physically in the park, go to the Wilderness Access Center (WAC) for information. 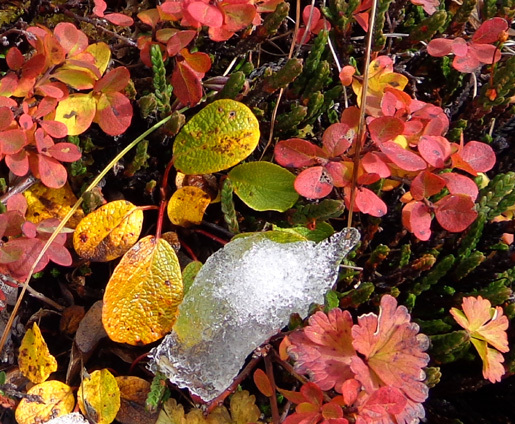 For a few days In mid-September the park allows visitors to drive all the way to Kantishna, assuming the road is still free enough of snow to keep it open that far. There is a lottery system for this privilege and it's not easy to get in because so many people are vying for limited slots. You can find all the information about this opportunity on the park's website. We haven't tried to get into the lottery. Both years we've left the state earlier than this so we didn't run into weather-related issues on the drive back to the Lower 48. I encourage people of all ages to visit this wild, spectacular park. I wish I'd gone up there at an earlier age than in my mid-60s. I'm glad we'll be going back to the park at the end of August. I hope some of these tips are useful to readers. Even with all the research Jim and I did before our first trip to Denali, it would have been nice to know some of these things. We learned a lot after we got there.